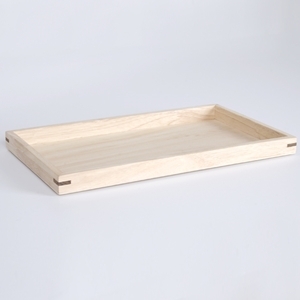 Home → Retail Jewelry Supplies → Jewelry Trays → Stackable Wood Tray 15"x8.5"x1"
This beautiful natural wood jewelry tray features flat wood feet that allow multiple trays to stack without sliding for travel, storage and display. Accommodates standard jewelry pads and inserts (sold separately). • 15" x 8-1/2" x 1"
Stackable Wood Tray 15"x 8.5"x1.5"